Artmoney is an International art project established by the Danish artist, Lars Kræmmer, in 1997. Artmoney are original works of art the size of big bank notes (12x18 cm) and with a fixed value of Danish Kroner 200 (Around US$ 33 or €27). Artmoney is attractive for art collectors, and can be spend as an alternative currency at shops and artists studios worldwide. Any artist can join artmoney and issue their own alternative currency, and there is no censorship on the visual expression. The project has generated a great deal of attention and debate because of its critical comments on art, finance and social cultural policy. More than 1300 artists from more than 40 countries participate as artmoney producers. More than $200,000,000 worth of art money has been issued during the first 15 years of the art projects life span. Artmoney has been featured with group exhibitions at several National and International galleries and venues and has been recognized as a real currency by International coin collectors and the National Museum of Denmark. The Danish Financial Supervisory Authority (finanstilsynet) decided in 2005 that the occurrence of "bank" and "money" in the name BIAM suggested financial activity, for which the required permissions were lacking. 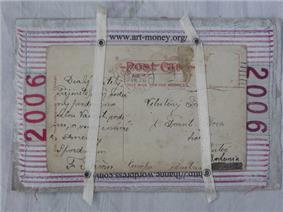 An appeal failed, but Kræmmer continued his Artmoney activities. In March 2008 he was told that he faces up to four months in jail if he continues using the "BIAM" name.